This article caught my attention recently. “During the course of her employment, Rednour’s blood-sugar levels dropped on two occasions while she was on duty — once while she was driving and again while she was caring for a patient in the back of an ambulance, Betz said. She drank some orange juice and Pepsi to raise her levels to normal. After the second incident, which happened in June 2011, her medic partner told her that he did not want to be paired with her anymore. Rednour told her supervisor and other Fire Department officials what had happened, and she was told she could not return to work without approval from the agency’s medical director, court records say. So she got fired after the EMT people “did some research” (or something?) and discovered that, huh, they actually should never have hired her in the first place, because their insurance (or whatever) didn’t cover diabetes. So she sued them (you go girl), and won 200K, and is now happily (I guess?) working as an emergency room paramedic in a hospital. First off, I have to talk about THIS stupidity, which fills me with such white hot rage that I can barely speak: “She would not be allowed to drive departmental vehicles for two to four weeks until her insulin doses were adjusted properly”. This is a statement written by someone who HAS NO CLUE ABOUT DIABETES. The arrogant assumption in it – that the lows were this woman’s fault, because her “insulin dosage wasn’t properly adjusted”, is actually enough to make me want to breathe fire. As though it’s as simple as talking to your doctor and “adjusting your dose” and then OH COOL YOU’LL NEVER HAVE LOWS AGAIN. IT IS LITERALLY IMPOSSIBLE TO PREVENT LOWS ALL THE TIME. IT IS LITERALLY IMPOSSIBLE TO BE A HUMAN BEING WHO MOVES THEIR BODY AND CONSUMES FOOD AND NEVER GETS LOW. That is not a possible thing. There is no “perfect adjustment” to be made to never get a low. I shudder to imagine what the moron who made that declaration thinks diabetes is. “Oh, I just need to take 4 units of insulin per meal and then I’ll never get low! I was taking 5, but now I’m fixed!” I ask you this, moron who made that statement: WHY EXACTLY DO YOU THINK LOWS STILL HAPPEN? WOULDNT EVERYONE JUST DO THIS PERFECT TRICK OF ‘ADJUSTING THEIR DOSE’ AND HAVE ELIMINATED THEM? I read somewhere – in an actual book written by an actual doctor – that if you have 4 or less lows PER WEEK, you’re doing good. Um… so this lady had 2 in multiple months of her job?! She sounds like superwoman. OK, rage rant over. Actually what really caught my attention about this article is the d-word. “Disabled”. Number FOUR. Number four on the list, people. I puzzled over this question for ever. 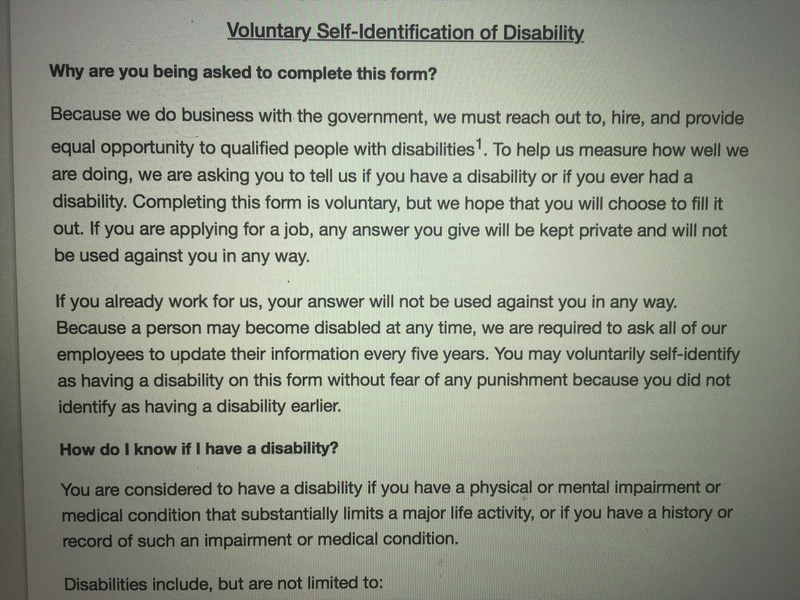 The way it’s written actually makes it sound like voluntarily self-identifying as “disabled” could gain you an advantage on your application. If they want to hire people with disabilities to look good to Uncle Sam, maybe I should say, hey, sure, include me on your list because I technically have one of the things that you listed there, even though I sure don’t think of myself as disabled. But if it helps you fulfill an obligation to the government, and gets me a job, let’s do it. But wait a minute, I thought. What if it’s a trap? What if by pretending that they WANT to hire people with disabilities, they’re actually just weeding out people with disabilities so that they can be sure not to hire them? What if they’re worried that I would be a liability, and this is a convenient way to get me to admit that I have a chronic illness, and would potentially cost them more (in health insurance premiums) as well as lost work time? OK, sure, it’s possible that I’ll have a low at work. But unlike the lady in the lawsuit, I’m not like, saving lives here. It’s an editor position – me getting low while editing something means I have to take a 60 second break to drink some juice. I look at it the same way I look at someone having to go to the bathroom at work – inconvenient, but by no means problematic. I mean, sure, lows don’t feel great, but I’m the one not feeling great, not the company. I’m a good, hard worker, and it’s now been over a year since I got diabetes. I’m also an incredibly responsible person, and understand diabetes self-care very well – I don’t expect I’ll regularly have lows at work, and if I do, I know how to treat them so that they’re minimally invasive. But wait, I think. Let’s really think this through. New job means a new place where I’ll be spending 8 hours a day, new people I’ll be spending 8 hours a day around. If I’m truly a “responsible diabetic”, I should be informing them of my condition, giving them basic details about the things that might occur, maybe, even, training them on what to do in case of an Extremely Unlikely Emergency. I suddenly start imaging teaching my new co-workers how to mix and inject an emergency glucagon shot (with a big motherfucking needle), and the “Am I disabled?” question gets a little more complicated. But what are the chances I would ever need them to use it? I’ve never needed an emergency glucagon shot (which would be necessary if I were to pass out from low blood sugar and be unable to be resuscitated before emergency workers came). If anyone in my life would ever need to know how to do that on me, it would be Stefan. And he does. And he’s never needed it. Even when my blood sugar was 30, I remained conscious. I certainly don’t feel disabled. And yet, I guess I do need, maybe, a little extra accommodation. I am very fortunate to have gotten diabetes at 26 rather than earlier, because it means that I’ve had fewer years with the disease, meaning less chance of developing complications. So far, I don’t have vision problems, or kidney problems, or nerve damage. This is very good. This means that, at this point, the only accommodation I need is a place in my new office to store some juice boxes, and to come in late once every three months so that I can make it to my doctor’s appointments. 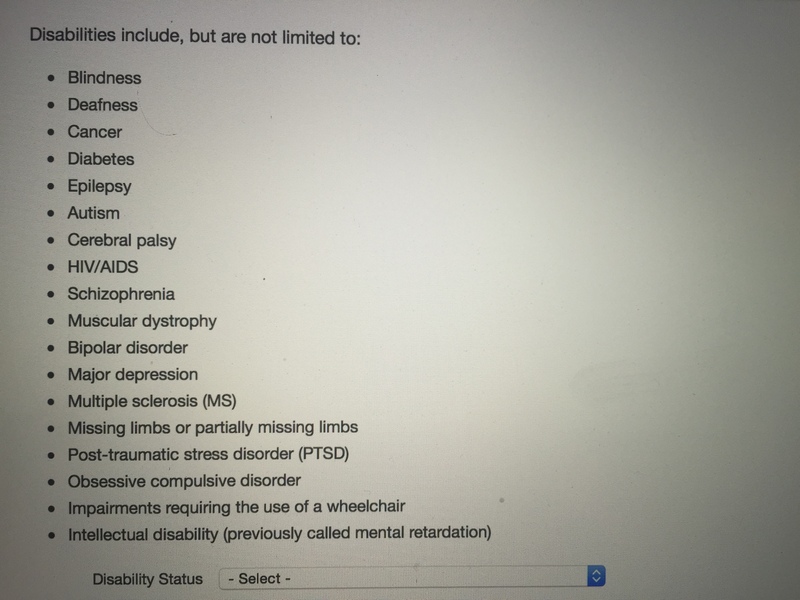 So, no, I wouldn’t classify myself as disabled. (Not “yet”, and hopefully never.) But, as the article I opened up this post with suggests, it’s not just about what I think – it’s about what those around me think. For those of you who are wondering, I was very up front about being a diabetic when I applied for my new job. It’s in the food world, and I decided to be totally honest in my interview about my recent unique and empowering experience with food. And, in this particular case, it seems to have worked out – after all, I got the job. I’m going to chalk that up to the open-mindedness and trust of the people I will be working with. I hope they are the rule, not the exception. Congratulations on the job! Speaking as someone who’s had to go through 100000 HR trainings about hiring, I feel pretty confident that they wouldn’t have a questionnaire like that used to discriminate, that would leave them really legally vulnerable. I’ve been repeatedly trained to not ask anyone about anything that might be a disability, and to basically cover my hears and sing LA LA LA if someone starts volunteering that information during an interview.